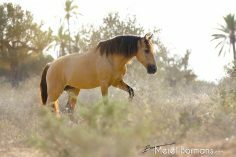 In this blog you will read about all our experiences during our first equine photo tour to Djerba in 2014. We left from a cold, foggy and cloudy Netherlands along with our participants on our way to sunny Djerba! The flight went smoothly and before we knew it we were already there, the pilot landed and we could take a first look at Djerba through the small plane windows. 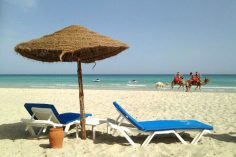 We saw beautiful green palm and olive trees and golden sand. While leaving the plane we were already welcomed by the warm sun and a wonderful temperature, yes 32 degrees is a bit different than the 12 degrees that we just had in the Netherlands! At the airport we were welcomed by Martine and Mohamed, the owners of the ranch where we’ll be staying during this photo tour. When we arrived at the stable we of course went to the horses right away. All of them were so beautiful! We could not wait until the next day to take the first pictures. It soon became dark and we sat around the table to get to know each other better. The first photo session was on the schedule. 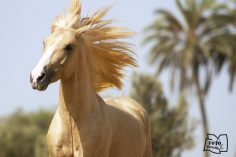 The alarm went early, because we needed a nice morning sun for the photos and at 7 o’clock we were all ready to photograph the handsome horses Raqas, Zarrouk, Flavio and Nassim in the typical Tunisian paddock. The horses showed themselves nicely and after the photo shooting, it was time to look at the result on our laptops. When everyone made a selection, we discussed the photos. It is always fun and educational to view the pictures that everyone has made so far and the results were very nice, so that promises a lot for the rest of the week! 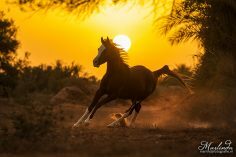 An evening sun, a beautiful environment and a stunning horse. 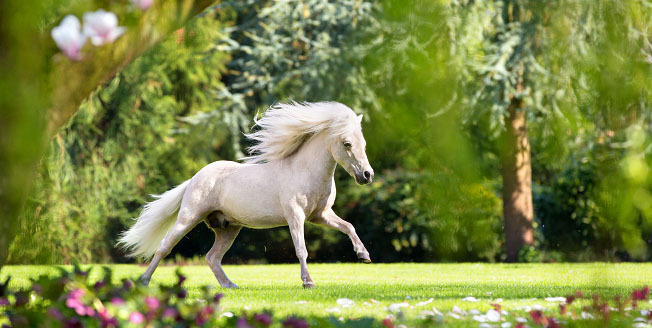 Kalife could run completely loose through the orchard, a very nice sight! But Kalife would not be a horse, if he did not want to go back to his own stable after a while and so he went back home in a nice gallop. Maktoub and Chems, the next horses we photographed, did their best as well and we got great photos out of this photo session! The alarm went early, so we would be on the beach before sunrise. Once there, the horses were already there. 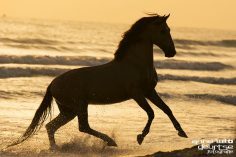 In the light of the full moon the horses were ridden to the beach accompanied by songs from the mosque. We started with the photo session and the sun emerged above the sea! 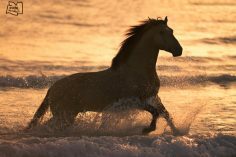 The horses Kalife, Darius and Zarrouk galloped through the sea in the morning sun, a stunning sight! After the sunrise photo session it was time to go back to the stable. We had a delicious breakfast and a relaxed afternoon on the schedule. 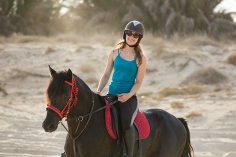 In the afternoon we went for a trail ride to explore the Djerba countryside. 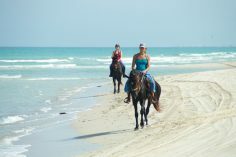 The horses were amazing, it was very nice to see more of Djerba while on the back of a horse! We went for breakfast and afterwards we would photograph Nassim and Pancho in the olive orchard. Nassim was able to trot and gallop all loose and he did a great job! The black stallion Pancho wore a beautiful bridle for some portrait photos. In the afternoon we went to the beach, where we first had a picnic on the dunes and then photographed the horses on the beach. The azure blue water was beautiful to see and Flavio, Raqas and Pancho loved to run through it. 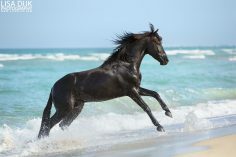 After the photo session we went swimming with berber stallion Pancho in the sea, which was a great experience! We were all super curious about the pictures taken and went to take a look at them when we returned to the ranch. After dinner we were able to view the results of everyone and the photos taken so far were stunning! 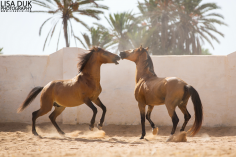 The stallions ran through the paddock, Kalife and Maktoub playfully challenged each other and made beautiful canters in our direction. 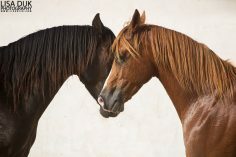 Then we photographed the Arabian stallions Darius and Chems. In the afternoon it was time for a ride on a dromedary, here fore we went to the beach. During the ride you were rocked back and forth because you were sitting on top of the bump, It felt very different than sitting on the back of a horse, a funny experience. In the evening we did a sunset photo session in the olive orchard. Raqas showed himself nicely! The next morning we went to the beach to relax a bit. We rented water scooters and raced over the water. In the afternoon it was time to go back to the stable for a trail ride to the beach. Over the countryside we rode to the beach, enjoying the beautiful surroundings. When we arrived at the beach it was time for a canter! 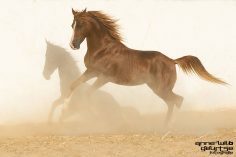 The horses loved it and are very powerful. During the ride we could also see flamingos in the distance. 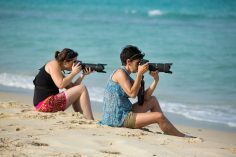 In the morning we went to relax on the white sandy beach and in the afternoon it was time for our last photo session. During this photo session we photographed horse and rider in Tunisian style. 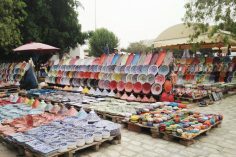 This morning we visited the town Houmt Souk to take a look at some local shops. It was a great way to experience more of the culture here. 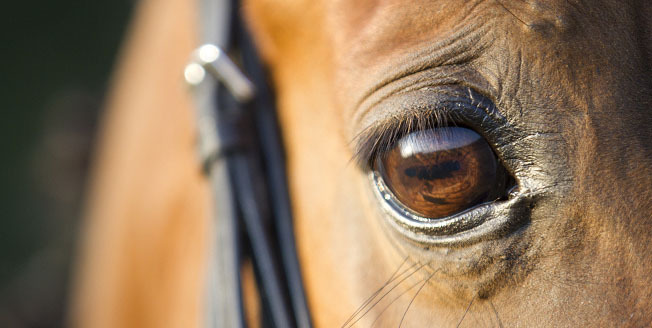 We look back on a great week with fantastic photo opportunities, a very successful first equine photo tour! 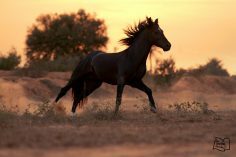 In 2011 Lisa and Marlinda started organizing equine photography days in the Netherlands and this how they started with Horse Photo Experience! How do you take the best action photos of horses? Which shutter speed, aperture and ISO do you choose and what do you need to take into account as well? In this blog we give you 6 essential tips!